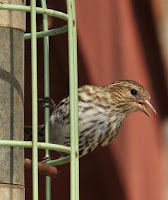 We've gotten many reports of Pine Siskins this winter and early spring. The incredible irruption of these northern birds into southern territories is like none in recent years, and siskins are still here as of April 7. But this big crowd of birds has brought with it a problem – aside from breaking our birdseed budgets with their gluttonous consumption. Siskins may be prone to disease. Kathy Cory of South Salem, N.Y. tells us, “I noticed a lethargic siskin in the yard this morning, which perished soon after. That's the second dead one in the yard this week, and I remembered seeing another sickly one a few weeks ago. On the Connecticut bird hotline, sick siskins have been a hot topic. Julie Keefer of Lyme said there were “a lot of reports of siskins dying in North Carolina this winter and I think it was pretty much a mystery as to why.” She wonders whether the ones succumbing here caught their fatal disease in the South – the ones we are seeing now may be migrating north and are not necessarily the same birds that were at our feeders in winter. One hotline participant said sunflower chips, which siskins love, have the advantage of not having hulls to get moldy and diseased on the ground.